James I was only five years old at his accession on the death in battle of his father Peter II. He occupied the throne until his death in 1276 and during his long and brilliant reign laid the foundations of the Aragonese Empire or, to give it its correct title, the Lands of the Crown of Aragon. In 1228 James wrested Majorca from the Moors and ten years later did likewise with Valencia. By these conquests he received the sobriquet of “James the Conqueror”. His first marriage was to Eleanor of Castile, by whom he had a son Alfonso, who died without progeny in 1260. 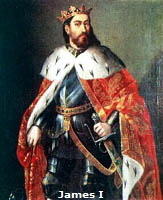 The King’s union with Eleanor was dissolved in 1229 and in 1235 James wed Yolande of Hungary. This marriage produced seven children, of whom three were sons. 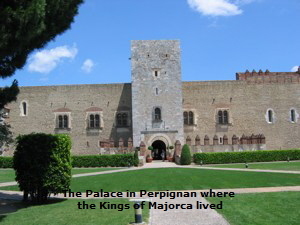 In due course the eldest became King Peter III of Aragon, the second James was granted the throne of Majorca (with its capital in Perpignan) in 1286, the third son Sancho became Archbishop of Toledo and was murdered in 1275. Of the daughters the eldest married King Alfonso X of Castile, while the second became the wife of King Philip III of France from which union the Royal House of France traces its descent from James the Conqueror of Aragon. Queen Yolande died in 1251. In the meantime the King had formed a relationship with Donna Teresa Gil de Vidaure, by whom he had had two sons, James Baron of Xerica, born c1255, and Peter Baron of Ayerbe and Lord of Paternò, born in 1260. After the birth of Peter the King married Teresa and had their two sons legitimised. Then, by his Will dated 21st August 1261, he provided that they should take precedence in right of succession to the throne over any of his daughters born of his union with Yolande. In 1260 the Pope recognised the marriage of James and Teresa and gave his consent to the known intention of the King, which in due time became the first formal law of succession to the Lands of the Crown of Aragon. The House of Xerica became extinct in 1309, but that of Ayerbe continues to this day.